We all know the feeling whether it’s your hands trembling as you flip through a blank exam or trouble sleeping while you worry about approaching deadlines. Stress is an inevitable aspect of life through college and beyond. While everyone understands the symptoms of the stress response, few know the underlying physiological mechanisms. When we probe beneath the surface of our anxiety, an elegant balance of stimuli and responses emerges. This paper will present a broad discussion of stress: how stress is defined, the chemistry and physiology underlying it at the cellular level, and the micro and macro level consequences of the stress response. Understanding the biochemical interactions that constitute the stress response requires a definition of stress. In the realm of biology, stress refers to what happens when an organism fails to respond appropriately to threats (1). While the “threats” humans face today often take more benign forms compared to those our hunter-gatherer ancestors faced, they can be equally taxing on our bodies. Some stress, of course, can be beneficial. The pressure it exerts can be an incentive to accomplish necessary goals. Often, however, stress reaches chronic, harmful levels, and deleterious consequences follow, from compromised immune function to weight gain to developmental impairment (2). The intensity of the stress response is governed largely by glucocorticoids, the primary molecules involved in the stress response. Stress can be ephemeral and beneficial, or it can be long-lasting and harmful, causing suffocation, depression, and paralysis (3). Proper stress management takes on great importance given the wide range of bodily systems impacted by stress hormones. Schematic diagram of how stress affects the body. The human stress response involves a complex signaling pathway among neurons and somatic cells. While our understanding of the chemical interactions underlying the stress response has increased vastly in recent years, much remains poorly understood. The roles of two peptide hormones, corticotropin-releasing hormone (CRH) and arginine-vassopressin (AVP), have been widely studied. Stimulated by an environmental stressor, neurons in the hypothalamus secrete CRH and AVP. CRH, a short polypeptide, is transported to the anterior pituitary, where it stimulates the secretion of corticotropin (4). 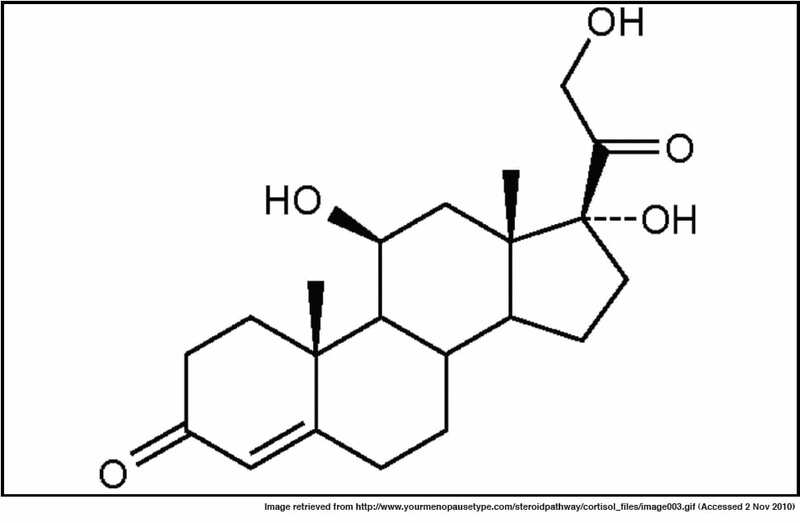 Consequently, corticotropin stimulates increased production of corticosteroids including cortisol, the primary actor directly impacting the stress response (5). Vasopressin, a small hormone molecule, increases reabsorption of water by the kidneys and induces vasoconstriction, the contraction of blood vessels, thereby raising blood pressure (6). 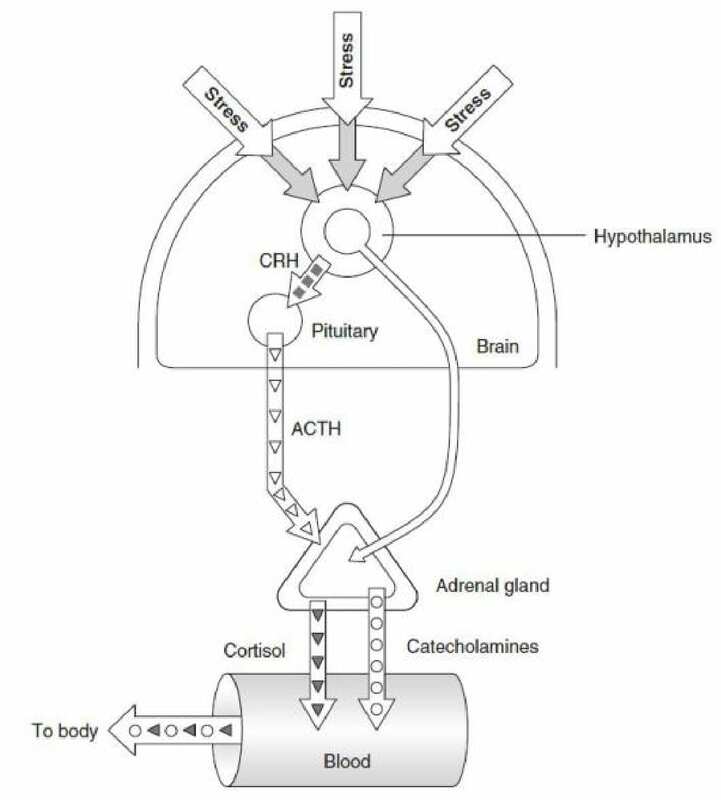 Together, CRH and vasopressin activate the hypothalamic-pituitary-adrenal (HPA) axis. The HPA axis comprises the system of feedback interactions among the hypothalamus, pituitary gland, and adrenal glands (7). In sum, the hypothalamus releases CRH and vasopressin, which activate the HPA axis. CRH stimulates the anterior pituitary to release corticotropin, which travels through the bloodstream to the adrenal cortex, where corticoptropin then upregulates cortisol production. Vasopressin, the other hormone secreted by the hypothalamus, stimulates the cortical collecting ducts of the kidneys to increase reuptake of water, resulting in smaller volumes of urine formed. As the next section will illuminate, corticosteroids such as cortisol act across the entire body to promulgate the stress response (8). Cortisol is a glucocorticoid hormone synthesized from cholesterol by enzymes of the cytochrome P450 family in the zona fasciculata, the middle area of the adrenal cortex (9). Regulated via the HPA axis, cortisol is the primary hormone responsible for the stress response. Expressed at the highest levels in the early morning, cortisol’s main function is to restore homeostasis following exposure to stress (10). The effects of cortisol are felt over virtually the entire body and impact several homeostatic mechanisms. While cortisol’s primary targets are metabolic, it also affects ion transport, the immune response, and even memory. Cortisol counters insulin by encouraging higher blood sugar and stimulating gluconeogenesis, the metabolic pathway that synthesizes glucose from oxaloacetate. The presence of cortisol triggers the expression of enzymes critical for gluconeogenesis, facilitating this increase in glucose production. Conversely, it also stimulates glycogen synthesis in the liver, which decreases net blood sugar levels (11). In these ways, cortisol carefully regulates the level of glucose circulating through the bloodstream. Cortisol’s beneficial effects are clear from its role in metabolism: during states of fasting, when blood glucose has been depleted, cortisol ensures a steady supply of glucose via gluconeogenesis. Cortisol’s role in ion regulation, particularly regarding sodium and potassium, has also been widely studied. Cortisol prevents cells from losing sodium and accelerates the rate of potassium excretion. This helps regulates bodily pH, bringing it back into equilibrium after a destabilizing event. Cortisol’s ability to regulate the action of cellular sodium-potassium pumps has even led to speculation that it originally evolved as a sodium transporter (12). Cortisol’s weakening effects on the immune response have also been well documented. T-lymphocyte cells are an essential component of cell-mediated immunity. T-cells respond to cytokine molecules called interleukins via a signaling pathway. Cortisol blocks T-cells from proliferating by preventing some T-cells from recognizing interleukin signals. It also stifles inflammation due to inhibition of histamine secretion (13). Cortisol’s ability to prevent the promulgation of the immune response can render individuals suffering from chronic stress highly vulnerable to infection. A role for cortisol in memory has also been demonstrated. The hippocampus, the region of the brain where memories are processed and stored, contains many cortisol receptors. While normal cortisol levels have no adverse effects on the hippocampus, excess cortisol overwhelms the hippocampus and actually causes atrophy. Studies of the elderly have indicated that those with elevated cortisol levels display significant memory loss resulting from hippocampus damage, but the exact age range at risk is unclear. There is a reprieve, however, for the chronically stressed: the damage incurred is usually reversible (14). Finally, cortisol participates in an inhibitory feedback loop by blocking the secretion of corticotripin-releasing hormone, preventing the HPA axis interactions central to glucocorticoid secretion. Many in the scientific community speculate that chronic levels of high stress disrupt the delicate feedback balance, resulting in the failure of feedback inhibition to operate and the continued release of cortisol (15). Stressed Dartmouth students often sacrifice sleep while increasing consumption of caffeine and alcohol, all of which impact cortisol levels and thus, the physiological markers of the stress response. While no connection has yet been established linking sleep deprivation to long-term HPA axis activity, acute sleep loss confuses the HPA axis and disrupts negative glucocorticoid feedback regulation (16). Leproult et al. found that plasma cortisol levels were elevated by up to 45 percent after sleep deprivation, an increase that has implications including immune compromise, cognitive impairment, and metabolic disruption (17). These consequences should give pause to anyone contemplating an all-nighter the day before an exam. Often, students decide to celebrate after a stressful episode by consuming alcohol, often in large quantities over a short time frame. Ironically, this method of releasing stress actually stimulates the HPA axis and encourages the manufacture and release of cortisol. In fact, the elevation in glucocortioid levels as a result of alcohol consumption can be greater than the elevation from stressful stimuli. Alcohol probably functions to activate the HPA axis by disinhibiting it: alcohol depresses the nerve cells responsible for HPA inhibition, thereby elevating HPA axis activity (19). As a result, the adrenal cortex secretes higher levels of cortisol. It is hardly surprising, then, that Dartmouth students and college students generally complain of the consequences of considerable anxiety and pressure: our common responses to stress, lack of sleep, caffeine intake, and alcohol consumption act in conjunction to raise the amount of cortisol in our bodies, augmenting the very stress we seek to combat. Many of us know from experience that stress compromises the immune response, an empirical observation buttressed by our understanding of cortisol’s physiological effects. Indeed, the effects of acute and chronic stress on human health are myriad and severe. During periods of increased stress, “the immune cells are being bathed in molecules which are essentially telling them to stop fighting,” according to Dr. Esther Sternberg (20). These molecules, namely cortisol, suppress the immune system and inflammatory pathways, rendering the body more susceptible to disease. High levels of stress, even over relatively short periods and in vastly different contexts, tend to produce similar results: prolonged healing times, reduction in ability to cope with vaccinations, and heightened vulnerability to viral infection (21). The long-term, constant cortisol exposure associated with chronic stress produces further symptoms, including impaired cognition, decreased thyroid function, and accumulation of abdominal fat, which itself has implications for cardiovascular health. The bottom line is that both episodes of acute stress and more prolonged stressful circumstances precipitate lower levels of general health, and exposure to such stress should be minimized. In the most extreme cases, Cushing’s Syndrome, characterized by dangerously high cortisol levels, can result. Those afflicted with Cushing’s experience rapid weight gain, hyperhydrosis, and hypercalcemia, along with various psychological and endocrine problems (22). Stress is unavoidable. Our bodies are designed to react to our environment in an effort to preserve homeostasis. Arming ourselves with an understanding of the mechanisms, agonists, and antagonists of the stress response, however, positions us to minimize stress and its impact on our minds and bodies. It is both a blessing and a curse that the HPA axis evolved to be so sensitive to factors like circadian rhythm, caffeine, and alcohol. We are experts at maintaining homeostasis but often novices at managing stressful circumstances. The good news is that stress levels rest largely on our own behavior and decisions and that we can optimize our bodies’ responses to stress based on how we live our daily lives.